Antique furniture is an exquisite work of art – hand-made, skillfully crafted, and durable enough to be passed from one generation to the next as a treasured family heirloom. However, the long years of constant use inevitably leave their mark on the delicate antique pieces, resulting in general wear and tear, faded colors, dulled finishes, and even structural damage. The negative impact of time can only be reserved with the help of subtle restoration procedures that can yield the desired result without changing its original character and ruining the natural grain of the wood. Only experienced and skillful craftsmen who have the professional know-how and the creative individual approach required to perform such a delicate work can successfully restore an antique furniture piece without affecting its status as an antique and decreasing its high value. 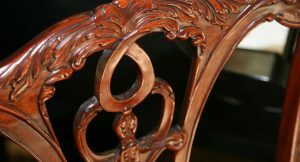 Furniture Medic by Bob Llorente provides expert antique furniture repair and refinishing services in Baytown, TX, to restore broken or worn out antique pieces to an excellent condition. Our qualified and skilled craftsmen use only simple tools and harmless chemicals to fix and revitalize damaged antique pieces. We carefully assess the condition of every individual antique and decide on the most appropriate restoration strategy that will not only ensure superb final results, but will also allow us to preserve the integrity and the original character of the piece. Any piece of furniture that is at least 100 years old is considered to be an antique according to the National Free Trade Act of 1993. However, if the piece experiences over a 50 percent change to its original character, it loses its status as an antique. Inappropriate restoration and repair may result in such considerable changes that will drastically affect the status and the value of your antique pieces. Therefore, you need to find knowledgeable and trustworthy experts to take proper care of your damaged or worn out antique furniture. The craftsmen at Furniture Medic by Bob Llorente use the least invasive techniques and products available in the industry to successfully restore antique pieces without losing their classic look and feel. We understand the criteria for antique furniture perfectly well and perform our work in a careful and skillful way in order to preserve the original character of the damaged pieces and to ensure the best possible result of the restoration project. Restoration/ Refinishing – we refinish worn out or discolored surfaces to restore their original beauty and luster. The gorgeous look and feel of the restored antique piece is solid evidence of the great quality of our work and the high level of our expertise. Furniture Medic by Bob Llorente is renowned for its first-class antique furniture repair and restoration services in Baytown, TX. You can contact us at (409) 356-4553 for more information and specific requests.